Up super early this morning. Darcy woke for a fed at 5:30am and i noticed that the sun was peeking through the trees so i tried to sneak out of bed to try my luck at a sunrise photo... no luck with the sneaking cos he woke. So i stuck him in bed with Tim and Jordy and grabbed the camera. I'm playing around with getting the star beam effect. This is probably the best one that i took. More practice to do. Lovely morning, and much nicer out in the bush rather than in van parks. Jordy and Darcy spent the morning playing with sticks and trucks and magnetic letters and climbing over the picnic tables and just generally amusing themselves which was really nice. Jordy convinced Mum to push him up the hill a few times on his bike. Had a leisurely pack up, and then a cup of tea (coffee) and cake before heading off. Mum and Dad had some bloody delicious fruit cake that they had been hiding from me but it was discovered and finished off :) Now i am wondering how we can arrange to have Robyn ship some more ahead for us. 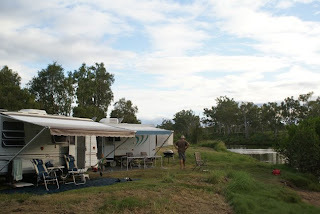 We had been planning to head to Dululu tonight to stay at another free bush camp on the road to Rockhampton. 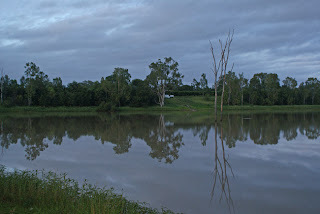 But we checked the BOM site and all looked good on the coast so we headed towards Gladstone instead. All nice hills and valleys and farmland on the way through. Stopped for lunch at Gin Gin, another free camp listed in the Camps 4. Was quite nice and would certainly suit an overnight stop but nothing particularly special. The kids had both slept in the truck for the 90min to Gin Gin so we gave them a good run around for a while before continuing on. After three attempts we ended up down by the river. We were half way through setting up and a helpful little girl of about 6yrs from up on the hill yelled down to us "What about the crocodiles in the river!" ... Huh? "Are there crocodiles?" ... "The sign says there are crocodiles." Okay then. We weighed up the options and (like idiots?) decided she'll be right and we'll stay where we are. But we are staying out of the water. Only took about 45min to set up. We are staying a couple of days so set the matting and table and chairs and weber up but have not worried about the annexe. Lovely full moon tonight. We saw a night time rainbow! Which was rather special. And Tim is outside at the moment enjoying a bundy and watching a firefly dart around the place.